At the heart of this exhibition is a painting which is often perceived to be shrouded by an air of mystery. The Arnolfini Portrait, to use its most common name, was painted by Jan van Eyck in 1434. We know this because written on the wall beneath the mirror are the words Johannes de eyck fuit hic 1434, Jan van Eyck was here 1434. But the subject matter of the is less obvious and has sparked much debate among art historians. 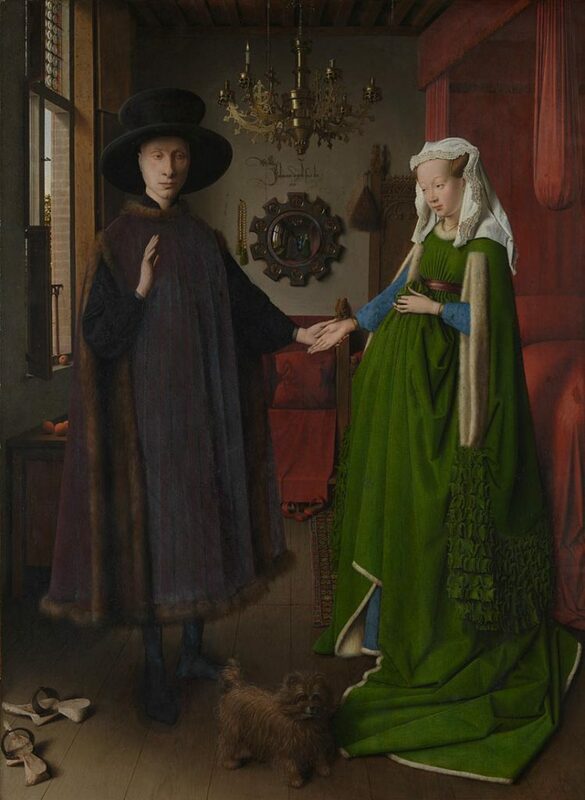 Conclusions vary from a betrothal or wedding portrait, to a visual legal document (witnessed by van Eyck) and even a posthumous memorial to the woman. When first exhibited in London in the 1840s the sitters too were unknown, making it all the more compelling. Generally speaking the Victorian audience was used to art that had a clear theme and didactic quality, whether derived from the bible, literature or everyday life. Against the morally instructive or readable images this painting would have seemed all the more foreign. It is one of those paintings that you need to spend time with, to let your eye scan and absorb all the detail, though seemingly simple at first glance. The couple, the Arnolfinis, are centre stage. The room feels compact around them, yet through the clever placing of the large window to the left and convex mirror facing us the artist plays with our sense of perspective, creating airy light and depth. 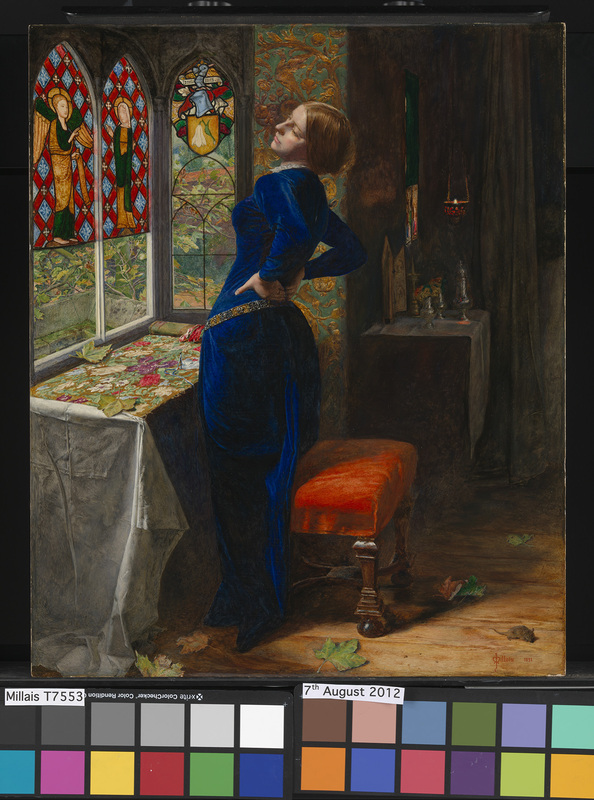 The mirror itself proved to be a useful and meaningful device for a young group of artists seeing the painting for the first time, artists that would later form the Pre-Raphaelite. Of course mirrors had been through the history of painting, particularly for portraits, self-portraits and themes of vanity. But the Pre-Raphaelite painters adopted the reflective surface and distortive quality of the convex mirror as a device to enhance their narrative and add dimension to their works. The Arnolfini family were successful textile merchants, and the rich colours and luxurious textures indicate the wealth and stylishness of the couple. From the deep, almost iridescent plum velvet of his fur lined tabard to the clean, crisp white of her ruffled kruselervan Eyck has painted the husband and wife in the latest fashions. The interior is also elegantly decorated, with expanses of crimson hangings, a Turkish rug and a shiny brass chandelier. The vivid jewel tones in the painting are set against the natural browns of the wooden floors, window frame and walls, creating balance and space. The tactility of the beautiful fabrics and furs adds further to the feeling of wealth, and showcases Arnolfini’s trade as well as van Eyck’s. He was a master of painting texture and manipulated oil paint to his advantage. There is much to compare with the Arnolfini Portrait; vivid colour, strong clear light, compressed space, symbolic objects. The high degree of realism with which everything is painted is something that is lost in the digital reproduction, but the attention to detail is remarkable. Her inky-blue dress (amazing in the flesh) and the way the light plays upon its velvety texture is astounding. But unlike the Arnolfini Portrait the figure is posed in a more natural and expressive way. Abandoned and snubbed by her lost fiancé Angelo, Mariana’s pining and weariness is directly comprehensible through her arched back and contorted body. Her hands attempt to ease the pain caused by hours of sitting and waiting by the window, bent over her embroidery. There is a hint of eroticism in her accentuated curves, hinting at the story in which she deceives Angelo by pretending to be someone else in order to sleep with him. Her downcast eyes and unsmiling mouth appear forlorn, perhaps regretful of her actions which have caused this misery. 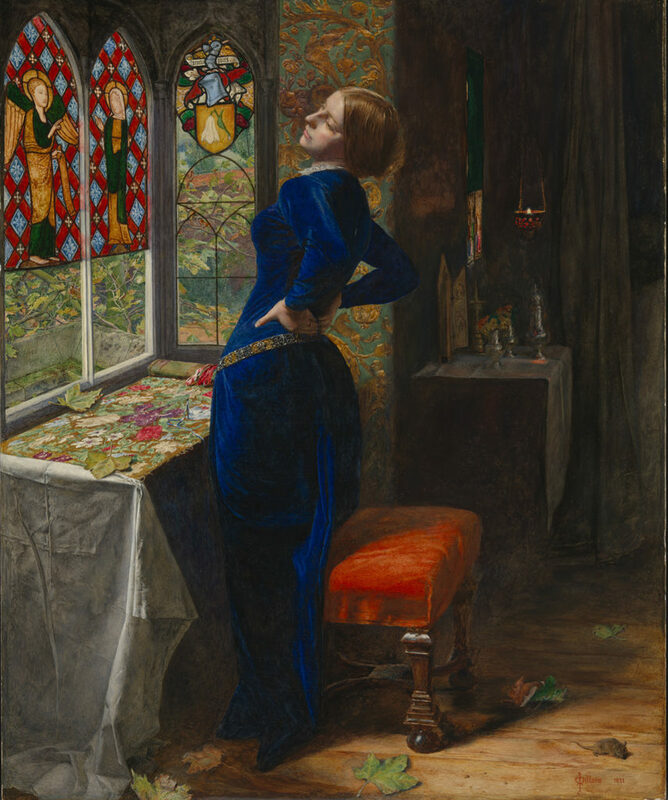 The arched stone casement and stained-glass window (copied by Millais from the Medieval Merton College in Oxford) shows the Annunciation, and a fictitious heraldic crest emblazoned with the motto In coelo quies, ‘In Heaven there is rest’. The passing of time is hinted at through the needlework laid out before Mariana, a clue to how long she has been waiting at the window. Her needle has been jabbed into her work as she stops to stretch. The creases on the left-hand side of the white cloth beneath it form a cross. Outside the trees and their browning leaves tell us it is autumn. In the back of the room single candle is lit at a mini shrine, complete with folding triptych. As a whole there is a feeling of impending doom. This femme fatale is in a state of perpetual limbo, existing in melancholy isolation within the ‘lonely moated grange’, a physical and mental state which leaves her wishing she were dead. The psychology embedded in it contrasts with van Eyck’s painting, and also with the next picture I have chosen. Il Dolce Far Niente roughly translates from the Italian ‘it is sweet to do nothing’. 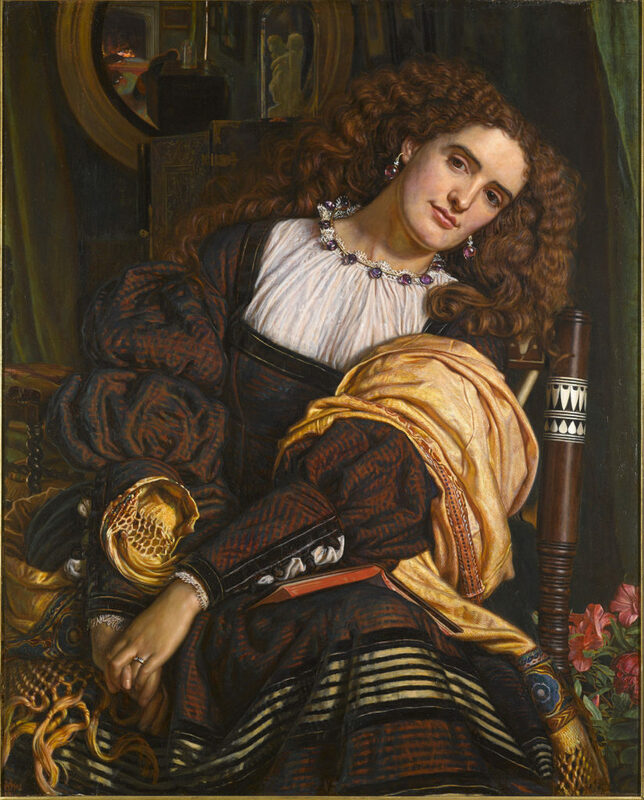 This may seem a strange title for a painting, but it became a popular one for the Pre-Raphaelites and other artists later associated with the Aesthetic movement. It gave painters such as William Holman-Hunt the opportunity to paint a beautiful girl in beautiful surroundings, and without a didactic subject we are able to enjoy the painting’s beauty, neatly bringing the theme full-circle. However, there is always meaning and interpretation to be found. I see domestic bliss, a woman at home enjoying her leisure. She wears a sparkling wedding ring and glass jewellery, hints at her comfortable position. She is in the process of moving, perhaps readjusting or stretching after sitting in one position for too long. The girl’s relaxed attitude, loose hair and a half-discarded shawl make this painting feel informal. An open book has been put down on her knee and in the mirror behind her we see the reflection of a fire burning low in the grate symbolise the passage of time, but in a starkly different way to that expressed in Mariana. Luxury is embedded in the colours and textures of the painting, particularly her thick fiery mane of hair, the soft pink-red flowers and the ivory-inlaid Egyptian chair (designed and commissioned by Hunt for his home). Hunt has employed the round convex mirror from The Arnolfini Portrait, creating the another layer of space to this closely-cropped composition. This gives us a glimpse into the interior beyond. There room is adorned with paintings on the wall, a statue of Cupid and Psyche, and a colourful rug. But as well as providing more visual information the mirror also poses a riddle. At first it seems that the woman is staring out towards us, but according to the mirror she is looking at the fire. Unlike van Eyck, who depicts himself in the mirror, there is no one else in the room here. The varied responses to van Eyck in this exhibition focus around the iconic convex mirror and how it could be used in paintings to manipulate space (as van Eyck did) and play with our sense of perspective. It allowed the artist to show us more than what was in front of us, whether a reflection of what we see or a manipulation of reality. Pre-Raphaelite paintings are often popular as beautiful objects, but this exhibition seeks to delve more deeply into them. While some of the links back to van Eyck are tenuous it is clear that artists used reflective surfaces to enhance their paintings. 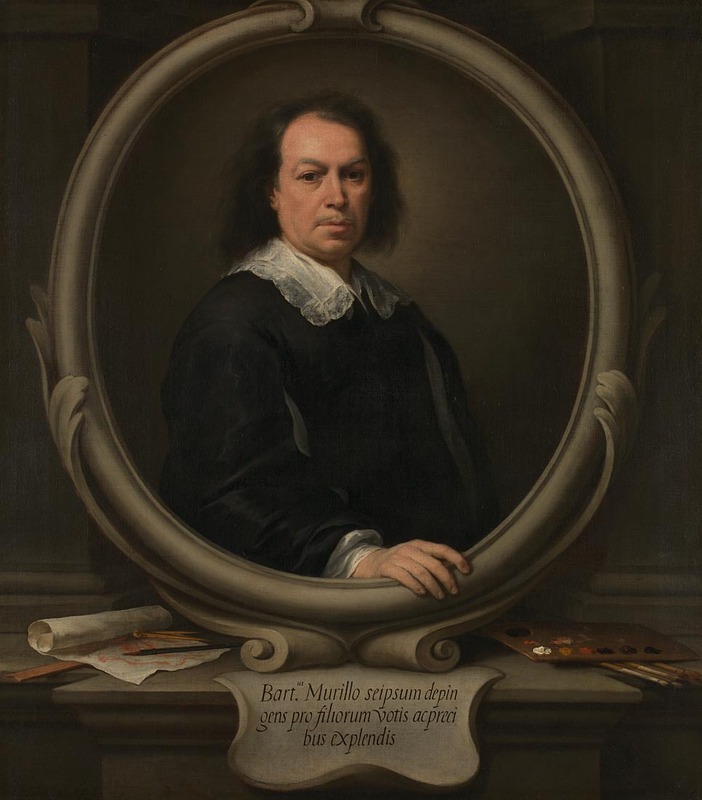 The Room 1 exhibitions at The National Gallery always fill me with excitement, but this display of Bartolomé Esteban Murillo‘s only known Self Portraits was set to be one of my highlights of the exhibition year – and it did not disappoint. The Frick Collection in New York has lent their version to hang alongside The National Gallery’s, creating the unique experience of seeing the works side by side. Also on display are a number of other paintings by the artist, and prints after his earlier self-portrait, which would prove to become the definitive image of the painter. Although Murillo (1617-82) was a virtuoso portraitist he didn’t produce a lot of them, and his fully-blown Baroque religious works are more widely known. While staying respectful to the traditions of portrait painting he put his own stamp on things, applying the acuity of his eye and with style very distinctly his own, depicting the most noble of sitters with a down-to-earthness which allows for their character to come through. He also painted scenes of Spanish street life, children and beggars, giving us a glimpse into the 17th century, some of which are on display here. 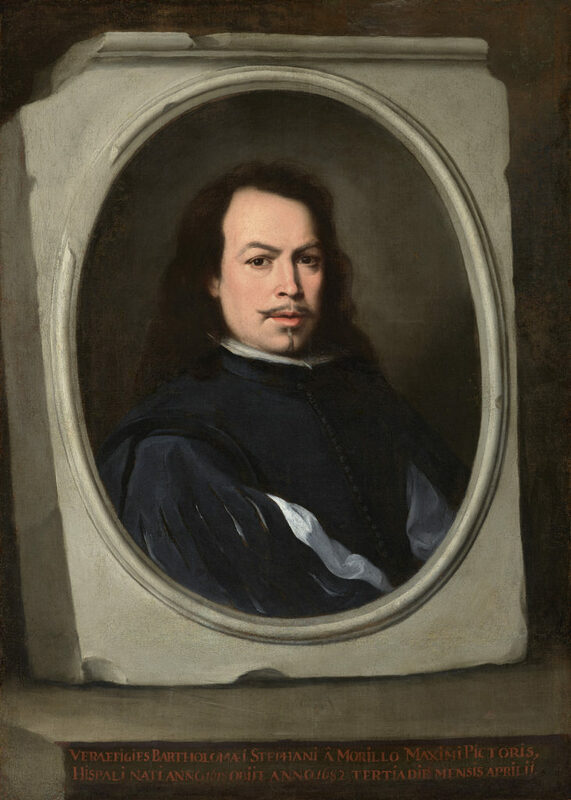 The Frick version shows Murillo in his 30s, the very image of a successful, fashionable and confident young man. Showing some influence of the earlier generation of Spanish realist painters (Velázquez, Zurbarán, Ribera) Murillo paints his face onto a stone tablet, playfully emulating Roman funerary portraiture. Pentimenti show that the chips in the stone were a later addition, and the red lettering was added after he died. The illusion is witty and imaginative, but it is his expression that really draws you in and makes this a spectacular and serious self-portrait. Murillo turns to face us, his posture upright and demanding our attention He is dressed stylishly in a black slashed-sleeved doublet with a white gollila and undershirt. The monochrome tones make his youthful complexion and red lips all the more lively, while complementing his dark eyes and thick mane of hair. His handsome face wears an enigmatic expression, one which I could look at all day. He gazes directly at us with a light squint and almost imperceptible raising of his angular eyebrows. With his mouth open as if he is about to speak and nostrils slightly flared you can almost see him breathing. The look in his eye scrutinises us, as we scrutinise him. About 20 years had passed when he painted the London version. His hairline has receded slightly, his thinning hair has greyed, his jaw is less angular and more jowly, and his eyes are tired. Still well-dressed he meets our gaze again in an almost defiant way, as if to say, time may have faded my appearance, but underneath I am the same spunky spirit. This time around he paints himself with the tools of his trade; a palette and brushes, a rolled up drawing with a pencil, ruler and compass, as if this is a visual advert of his talents. The Latin inscription reads ‘Bart(olo)mé Murillo portraying himself to fulfil the wishes and prayers of his children – or sons’. He looks out at us from a more decorative stone frame with a hint of classical architecture behind him. The plaque that bares his name and the base that supports his image speak of more contemporary style, making this later portrait more of a monument than a memorial. This time his defiance of stone goes one step further as his right hand escapes the two dimensional surface of his own painting. This fantastic trompe l’oeil tells us something of Murillo’s personality as well as his abilities as a painter. With little else going on in the painting in the way of detail or symbols, it is his fusion of realism and personality that make these two self-portraits masterpieces of the genre.